Actinidic archaea has been related to global warming and human diseases especially autoimmune disease, neurodegeneration, neuropsychiatric disorder, neoplasm and metabolic syndrome x. 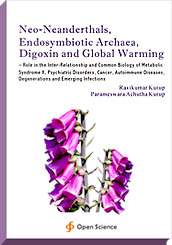 The growth of endosymbiotic actinidic archaea in relation to climate change and global warming leads to neanderthalisation of the human mind-body system. Neanderthal anthropometry and metabolonomics has been described in autoimmune disease, neurodegeneration, neuropsychiatric disorder, neoplasm and metabolic syndrome x especially the Warburg phenotype and hyperdigoxinemia. Digoxin produced by archaeal cholesterol catabolism produces Neanderthalisation. Prefrontal cortical atrophy and cerebellar hyperplasia has been related to autoimmune disease, neurodegeneration, neuropsychiatric disorder, neoplasm and metabolic syndrome x in this communication. This leads on to dysautonomia with sympathetic hyperactivity and parasympathetic neuropathy in these disorders. Actinidic archaeal related cerebellar dominance leads to changes in brain function. This is the common biology of human disease. Climatologists, Environmental Biologists, Virologists, Epidemiologists, Physicians and General Public.